Hello friends and welcome! It’s time for another installment of the Sketch Challenge for Hip Kit Club. I am using the November 2018 Hip Kits. I am using the Main Kit, the Project Life Kit, and the Color Kit. This was my sweet pup Homer. He’s been gone for years now, but he’s still my favorite boy, and I miss him terribly. He was such a smart boy! He loved his tennis balls, was awesome at Hide & Seek, and loved me the most. I still think of him often, and decided that I needed his photo in my TN! Today, I have a card to share with you, using stamps from Scrapbook.com. I am using the DIY Coupons and You & Me Quotes and Sayings clear stamp sets. I also have a YouTube process video if you’re interested! When I saw the DIY coupons set, I immediately thought of my pre-teen daughter. I know we all think of handmade coupons as cheesy, but I thought that it could be a perfect gift for my daughter, instead of money or gift cards…lets face it, I’m going to be paying for it either way, haha! First, I worked on the card. On a couple pieces of Neenah white card front, I ink blended some Tim Holtz distress inks with an ink blending tool. I love that Scrapbook.com offers these card fronts that are precut to size, and it’s my favorite white cardstock too! I used the distress inks in colors picked raspberry, ripe persimmon, squeezed lemonade, twisted citron, peacock feathers, and wilted violet. I used the circle “Unlimited Hugs Included” stamp from the DIY Coupon stamp set on my Misti stamping tool, and the Scrapbook.com black hybrid ink to stamp the image on the inked cardstock. Next, I used a 1 in circle punch to punch out the circles. I heat embossed the “I Adore You” sentiment from the You & Me Quotes and Sayings stamp set onto black cardstock. I used Versamark ink and Ranger super fine white embossing powder. I trimmed the sentiment. I put my card together by using a precut & scored Neenah white card base, and some scrapbook adhesives 3L foam squares to attach all of the elements. I really love how clean and simple my card turned out! Next, I started work on my coupons. I inked up a few more pieces of the Neenah card fronts with the Distress inks, and stamped the coupon/ ticket images with the Scrapbook.com hybrid ink and my Misti tool. Then, I fussy cut the coupons. I filled the coupons out with stuff I knew my 12 year old would love…a trip to our fave ice cream place, movies with a friend, and a shopping spree. I decided to make a little pocket on the inside of my card to hold the coupons. I just made a small pocket using a piece of pattern paper from Lawn Fawn (this is one of the older 6×6 plaid paper pads, but here are some others) and some 1/4 in double sided tape from Scrapbook.com. I really love how this project turned out, and I hope you do too. Let me know if you decide to make this project for yourself! I’d love to see it! Today I’m sharing my first layout using the November 2018 kits. I am using the Main Kit, Project Life Kit, Embellishment Kit, Color Kit and Cardstock Kit. For this project, I was challenged to use Hip Kit Club exclusive products, which was easy to do since this month’s kits are jam packed with exclusives. A lot of the products have to do with home sweet home, so I thought it would be a perfect opportunity to make a layout about our new home. We moved into our dream home just a few months ago! I started off by using some of the products in the color kit. I used one of the Heidi Swapp cardstock stencils and some white embossing paste to add some texture to the cardstock. Then I used the Shimmerz vibes in Deep Blue Sea & creameez in Good Ol’ Summer Time to add some splatter to the background. Once dry, I started pulling exclusive elements that I thought I would want to use on my layout. I cut a few strips of pattern paper (the blue paid & light blue with white leaves paper is an HKC exclusive), and then machine stitched them towards the center of my layout. I had originally planned to just put my photo on a large pattern paper mat, but then I decided to use an exclusive Project Life card. I couldn’t quite get the layout right, until I decided to have 2 large pattern paper squares…one for the photo and one for the journaling card. Next, I just used various exclusives to embellish the squares. I used HKC exclusives Home Sweet Home ephemera, Home Sweet Home puffy stickers, leaf acetate, and wood veneer stickers. To finish off my title, I used a Jen Hadfield matte gold phrase sticker that says home, and the HKC exclusive mini puffy alpha stickers to spell out Home Sweet Home. I am really happy with how my layout turned out, and I hope I’ve inspired you to get crafty! Don’t forget to check out all the great exclusives in the November 2018 Hip Kits. Today I’m sharing a card featuring Spellbinders new clear stamp collection. I will be using the Thanks a Bunch and Sentimental Words stamp sets. I love this cute little stamp set. You can use the floral stamps to layer or you could keep the flowers one layer, like I did with the big red flower. Instead of layering it, I added a glitter enamel dot to the center. I used some lawn fawn inks, and created a wreath with the floral images. For the sentiment, I used the “hello” from the Sentimental Words stamp set, and heat embossed it in gold. The “Love You” sentiment is from the thanks a bunch set, and I heat embossed it in white on a piece of purple cardstock. I mounted the card panel on pink card stock to match the flowers. to finish off my card. I will admit that this card took a little time to create, because of all the layers and the different ink colors, but I love how this feminine, clean and simple card turned out! Thanks for stopping by, and don’t forget to check out the Spellbinders shop! Today I’m sharing a layout of my daughter dressed as Frida Kahlo for Halloween this year. When we were trying to figure out her costume this year, I told her to think about some inspiring women. This girl loves art, so when I suggested Frida, she was all for it! I thought the colors, florals, and ephemera of the Hip Kit Club October kit was perfect for a Frida layout. I was challenged to use the Main Kit, and add in some fussy cutting and layered ephemera. I am using the October 2018 Main Kit. First I started off by fussy cutting all the hexagons from the Paige Evans paper. I used one of the hexagons as a template, and cut out a few more from the other pattern paper in the kit as well. I ended up with way more hexagons than I needed, so I decided to layer them, and stitch down the middle, as I have done previously with other shapes. Next, I decided to paint some black stripes onto a piece of white cardstock. I’ve always wanted to try this, as I’ve been inspired by other scrapbookers like Paige Evans, Missy Whidden, and Jana McCarthy, and I thought if not on a Frida layout, then when?! LOL! Next, I added my photos, a title, some journaling, and a few bits of ephemera. 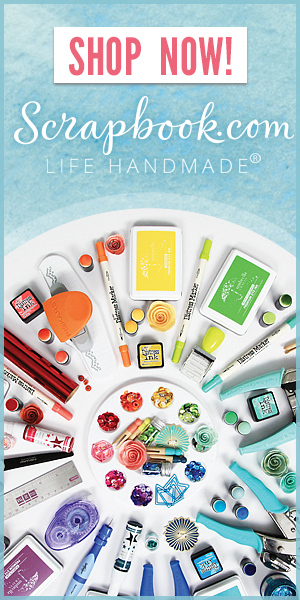 I have to admit that the 3 tubes of paint and the tiny paint brush is from the Paige Evans puffy sticker sheet included in the October 2018 Project Life kit. They were too too perfect for a Frida layout that I couldn’t resist! I added some splatter, and a few hand doodled stars to finish my layout. I love love love how this layout turned out, and I hope you do too! Hello friends! I hope you are doing well. Who’s getting excited about Holiday crafting? I know I am, and the Pinkfresh Studio Holiday Vibes Collection is absolutely stunning! I love the classic red and green of the collection, with the pops of blue! My girls were wearing navy blue with red accessories when they went to visit Santa last year, so those are the colors I chose to concentrate on for my layout. I often incorporate stars in my holiday layouts, so for this project, I created a cut file using the same star shape in various sizes, cascading down the center of the paper. I cut it out of white card stock, then hand stitched around 3 of the stars for more interest and texture. I added some water color splatter by mixing a couple colors of the Pinkfresh Studio watercolor paints. I backed all the stars with pattern paper using foam squares for dimension. I used the Merry Christmas, Magical Forest, Christmas Cheer, and Let It Snow pattern papers. I then used a couple of the stars that were cut from the white card stock to fill in the middle of some of the bigger stars. Next, I mounted my photo onto a few pieces of pattern paper, and added it to the left side of my layout. I embellished it simply with a few labels and a string of lights from the ephemera pack, and a naughty or nice sentiment from the puffy stickers. I used a combination of the color dipped wood alpha, and the navy and gold chipboard alpha stickers for my title. I absolutely love the wood veneer alpha; They are perfect with this collection, but are so neutral, they would work on non-holiday projects as well. I added a little journaling on a banner that I stamped. The banner is on the Pinkfresh Studio Home for the Holidays stamp set. I finished off my layout with some puffy stars and enamel dots. I really love how clean and bright this layout turned out. I love the Holiday Vibes collection, and I encourage you to check it out for your holiday projects! I made a layout about my parents. I am so thankful, blessed, and grateful for my parents. They have worked so hard all their lives to provide for me and my sisters, and they are the best grandparents! The cut file is by Paige Evans called Thankful, Blessed, Grateful. I used the Indigo Hills 2 collection for this layout. I used the Eminence paper for the background, I backed the cut file with the Ridge paper, and I fussy cut flowers and leaves from the Glen and Meadow papers. I used the gorgeous chipboard frame around the photo of my parents. I also used some leftover layered hearts that I made for a previous project (I love these so much!). Next I added some enamel dots to finish up my project! Don’t forget to partake in this month’s challenge. I can’t wait to see what you all come up with! Today, I have a holiday card to share with you . Fun Stampers Journey (FSJ) and Spellbinders have come together on November 1st 2018, and today I’ll be using the Most Wonderful Stamp set, and a few jewels from the Holiday Sparkles gems. I really wanted to create a one layer card, and I also wanted to highlight all the stamps in this set, so I made a 5×7 one layer card. First, I heat embossed the sentiment in gold in the center of a 5×7 card that I made. I chose 3 spots where I wanted the red flowers to go. The rule of 3 is pleasing to the eye, and I wanted to map it out. Next I masked off the back side of the card using painters tape. Then, I stamped the other images around the sentiment and flowers using various shades of green and teal ink. Don’t forget to check out the other FSJ/Spellbinders products here! I hope you like my card! I love how it turned out! Thanks for stopping by!